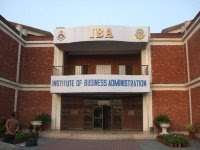 In business administration IBA Lahore secure some position in study market not like big giants like LUMS, LSE, IBA but they have some good reputation in industry. I mean organizations like IBA-ians. Recently they got new building build right before the old one. In new building classes are quit modern, seminar rooms are their and students sometimes feel jealous for those who got them. Some teachers are highly qualified but mostly lecturers are new but competent. I'av visited IBA many times and I noticed changes every time, good changes of course. Under they supervision of Dr. Muhammad Ehsan Malik IBA is growing. One thing that is very attractive for those who cannot afford expenses studies of LSE and LUMS they can get admission in IBA for very affordable fee. Institute of Business Administration is offering MBA program for quit a few years and their MBA's are preferred but not so much. Its not to long ago when IBA started Bachelors of Business Administration and they haven't produce their first batch yet, first batch is currently doing their internship in different government and private organizations. Lets have some quick review of IBA in different categories. HISTORY: Longtime ago Punjab University established Department of Business Administration in 1972 which was upgraded to Institute of Business Administration in 1987 that was a milestone as they were the second to offer business studies at this level. They shifted to their existing building 1994 and got addition of one more campus 4 years ago. BASIC INFORMATION: IBA Lahore is situated in Punjab University Quid-e-Azam campus. Its specialized institute in business administration field and producing some gentlemen and women to compete in market. STUDENT TALK: Okay here is my favourite part Students Talk. While talking to some pretty faces I came to know much about IBA i.e they were satisfied with building and class rooms. A student of BBA final year give me quick snap of IBA in these words " well Mr Shahzaib our building and rooms are good, computer lab and library is also up-to-date, faculty is normal is normal some professors are good but most of them are new, cafe is fargh(bad), studies are not tough, girls common room is good but not air conditioned and overall environment is good". After this much comprehensive review I was really impressed with her and wonder that if all the students got this much confidence and communication power or not. FACILITIES: Facilities at IBA Lahore are Average. Yes despite of students' satisfaction I personally feel that there is enough space for improvement. Computer lab is maintained well with high speed Internet connectivity, new building class rooms are fine and overall building is nice. Lawns are although green but not crafted to standards. Cafe is below average with little variety and low standard food I found many IBA-ians crossing the road for Mass Com's cafe. MARKET WORTH: Market demand of IBA students is good but starting pay is not as much high as one can expect. Some companies hire students directly from IBA including Coca Cola, Suzuki, Engro Foods. IBA place students for internship in big government organizations including Stat Bank Of Pakistan, Sui Gas, National Bank, Fauji Foundation etc and Private firms like Coca Cola, Nestle, PC etc. So for job placement and market worth IBA can be eligible for Average+ but as far as pays are concerned Average could be enough. PROGRAMS OFFERED: Main feature of IBA's programs is PhD in business Administration other programs are listed below. WEBSITE: IBA don't have its own website but there is a link on PU's webstie that can be reached by click here . Is it official site of IBA Lahore? @Muhammad: Yes they just got their own website and its official. Whats the average starting salary for graduates? Starting average salary is some where about 15000 to 20000. Depending own student to student. IBA is way above than LSE in everything. It has a Global Brand name. Lawns are although green but not crafted to standards. Cafe is below average with little variety and low standard food I found many IBA-ians crossing the road for Mass Com's cafe. Studentstalk.pk is the foremost medium of knowledge for Students in Pakistan. It is the largest portal which gives numerous solutions to student’s affairs. It Provides discussion forums on various topics which help students to complete their assignments, giving relief to them by putting all information regarding admission of all schools, colleges and universities. “Donate Blood – Save Life” forum contributes to save life in case of any mishap by providing the donor information list. Facilitate the students to buy/sell books and other related stuff. Assisting outstations students to find a good hostels at cheap prices and share the ride facilities to go outstation. Career consoling is necessary for students to choose the right path according to current demand, studentstalk.pk is a career counselor as well. Also includes information about different events going to held in different institutions to get more knowledge and amusement. CAN ANY ONE TELL ME THE DATES OF MBA IN HR 3.5YEARS AFTER B.COM 2 YEARS ADMISSIONS IN LAHORE UNIVERSITIES BY THE START OF 2018?